LYING ON YOUR CV ...NECESSARY EVIL? Please, don't act like you don't know people lie on their CV, they add little jara here and there just to get a job and I really would not blame them: it's not an easy world out there as a job-seeker and desperate times call for desperate measures, besides, who is really going to do a background check to see if e-v-e-r-y-t-h-i-n-g on the CV was true or false (especially in Nigeria)? You can also learn on the job so why not fake it till you make it abi? Talk true make devil shame...have you lied on your CV? Ha ha ha...some of us have added jara somewhere. Lying on your CV could be the best thing you've ever done, after all, isn't the aim to get a job and feed your family? Get the job then go and do thanksgiving in Church about how it was such a miracle! Hmmm...God is good. It can also be something you'd regret doing for a very long time. Like I said earlier, I do not blame anyone who has resorted to doing just that; na condition make crayfish bend. Have I lied on my CV before? Well...I eerrrm...well... *shrugs. I think is a little frustrating when you have the qualifications yet no one would give you a call back when you apply for jobs, yet when you add one tiny white lie, the calls start coming...it's frustrating. Some argue that there's nothing wrong with lying on your CV as long as in the end you can prove that you can do what you wrote there. If a job requires that Microsoft Excel is a necessary skill, you can add it to your CV and learn it before you start the job. Is that acceptable? You can learn along the way. Thank God for YouTube! Stella Oduah is popular for a lot of things but more recently adding jara on her CV...mama didn't even go light, she put a whole big degree there, but she forgot to do her homework. Even the former CEO of Yahoo! was forced to resign after it was discovered that his resume was a bit urm...you know. Never ever ever be caught in that kind of situation. It will make your employer, colleagues question everything you've ever said was true.You may get away with lying in some countries or some corporations and may not be so lucky in others. 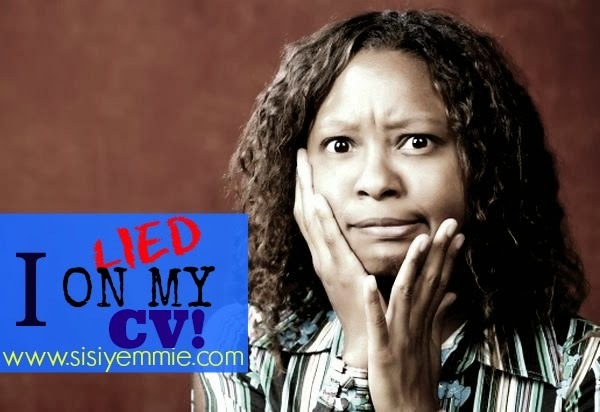 You do not need to out-rightly lie on your CV, you only need to embellish it! Embellish is not you a former office administrator writing that you were the formal assistant general CEO of such and such. Don't lie about your work experience but word it in a way that would make you look competent and suitable for the role you're applying for. You can start by adding keywords: look at key words in the job description for which you're applying and use those key words to highlight your skills. If you're submitting it electronically keywords will help your CV/Resume get picked up! Maybe you don't have a lot of experience? You should focus on your skills section especially if your're a newbie. Skills like computer skills, management training, and any certifications you have should increase your chances of nailing the job. Please don't claim to have skills you clearly don't possess because if you get the job and you cannot do the thing wey you say you fit do...yawa dey o. Hiring managers receive loads of CV's and may not have time to go through the whole page/pages so you might want to move the most important elements to the top of the CV...put your best foot forward. Feel free to amend your previous job title especially if it is synonymous with the current role you're applying for. For example instead of leaving it as office contact, why not amend it to administrative assistant? It's just a better name, but same job description. You get? If you know your CV is not robust then maybe you should focus on the packaging...it doesn't hurt. Get the hiring managers attention with a nicely arranged CV...biko don't be putting florals and hearts oh: not that type of design. One tip I always use is sending my CV out in a PDF format, word documents can appear different on some computers so to make sure everything is as you want it, save and send as a PDF format. Let me not lie...I added jara on my own CV and I GOT THE JOB! In this Nigeria? just add jara. Nothing wrong with that. I need to comment as anonymous. Sisi I searched for job tire I didn t get, the miniute I added jara...bingo! I was getting more offers. Lying sounds flat out wrong. 'Embellish' is more like it. Plus, it happens everywhere (nor be only Naija). Don't go applying for a job you know absolutely nothing about. It's going to be a waste of both parties' time. In addition to the 'jara' on your resume, during the interview, be prepared to articulate your relevant experience/skills. Do your research on the company you are interviewing with and find out how your experience/background makes you a good fit for the job. Sisi Yemmie, nice tip on the pdf format. I never thought about that. Omo! I've been playing honest o! Maybe its time to go Nigerian... lol but I dunno mehn! Hi Sisi yemmie, all i do shape my skills to fit what they are looking for but I don't lie. Abeg, let's just keep a big padlock on that #StellaGate for now. Now sure I'm ready to burst with laughter. Lying on the resume: easy to do, easier to regret. Best is to go as you've pointed out - packaging! It's just like advertising, really. You don't have to lie; just make it seem like what they [employers] want. And, you only have to be on top of your game. That way, one can easily point out skill-set similarities between a previous job [or experience] and the desired one. Just got a brain wave and embellished my CV. Cut out a job i did not really relevant to my career path and stretched time in other jobs done back and forth; now my CV is banging! Need to step up this quarter. So help me God! Lie OO.. But not too much.. Its not like you will use pen and paper to do the job. wishing you more success in your career. i saw you on TV just a while ago. REVIEW: FEDERAL PALACE HOTEL SUNDAY BUFFET! WHY ARE YOU NOT MARRIED... AT YOUR AGE??? Outfit Of The Day|| Beta Pikin! REVIEW: CHEF FREGZ CHRISTMAS SPECIAL!!! RECIPE: HOW TO COOK EGUSI SOUP #1 ! MONDAY CHIT-CHAT: SHORT & SWEET, ALL YOU CAN EAT! REVIEW: THE BANKY AND TIWA SHOW! MY TOP 5 HOLIDAY DESTINATIONS FOR 2014! THE KNOTTED WRAPPER: SHOULD IT STAY OR GO?